Like with any business it’s important to stand out, and with more WordPress maintenance businesses thriving, I wanted to find out what does it take to be different, rather how to get clients to pick you. Joe Howard from WP Buffs has already shared some insightful information on how to get started in the world of freelancing, and I wanted to find out how WP Buffs came about, what’s unique about them, what tools they use, and how they position themselves in the WordPress community. Joe, who if you haven’t met is the friendliest person around, made sure I had all of the answers I was looking for. How did you first get started with WordPress, and what led you to starting up a WordPress website technical support business? The first startup I ever got involved with was a very early-stage SEO agency. I was brought on as the Director of Operations. The title sounds impressive, but when you’re the first employee of the company, it really just means you do some of everything. We ran digital marketing campaigns for clients across a range of different industries. But it turns out along with digital marketing services, people wanted new websites too! We decided to meet that demand and use WordPress as our Content Management System of choice. The reasons were pretty straight-forward: It was simple enough for non-technical people (like us) to host, launch and build websites and the open-source component meant a vibrant community to get help when we got stuck. After experiencing the revenue rollercoaster of building websites at startups and as a freelancer, I wanted to find a solution in the WordPress space that would 1) allow me to help people improve their websites, and 2) make more predictable monthly recurring revenue. So, I put together wpbuffs.com one weekend while I was still working full-time as an IT consulting. A few months ago, I went full-time on WP Buffs and I haven’t looked back since! I like your slogan, “We are your new CTO” – what does that mean to you? I wanted a slogan that described exactly what we do in a concise and direct manner. I was always a big fan of the catch phrase for the original iPod: “1000 songs in your pocket.” I wanted WP Buffs to engage with the WordPress community in a similar fashion, and after trying 10-15 other descriptors, we settled on being people’s WordPress CTO and technical WordPress partner. It just resonated well with our audience and the WordPress community. Short, sweet and packs a punch! Today there are numerous support businesses, why should someone choose WP Buffs? Our showcase customers show the world exactly what we stand for. Take trumptracker.news. Their team gathers, curates and shares accurate news from trusted sources. We’re helping to promote the dissemination of qualified content in the fight against fake news. We manage their website so they can combat noise with knowledge. I’m hopeful the fact that we donate a 100% free maintenance plan to support the kind of work they’re doing is a big differentiator. Tell us the story of how did you land your first client. Any tips for others starting out? You’re really bringing me back with this question! 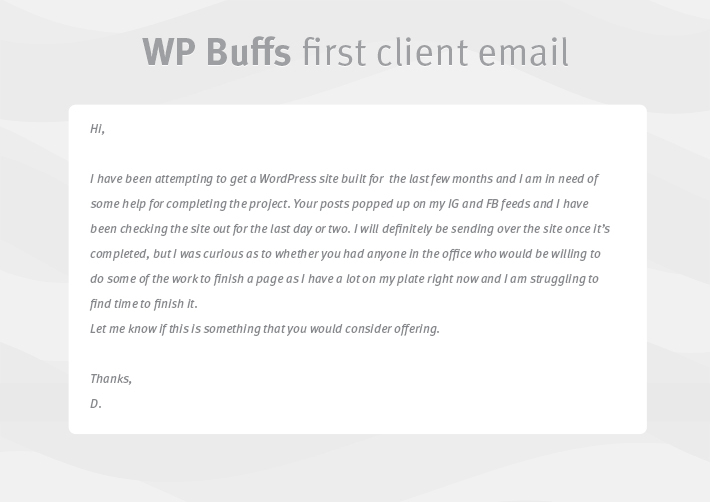 The first official WP Buffs client we got contacted us through the contact form on our website. I wanted to focus on simply providing maintenance instead of building and completing websites, but as is the case with most young companies, I was more interested in generating revenue than only offering one service. We got D. on board and we still maintain his site to this day! I pulled in one of my freelancing clients to have them pay WP Buffs instead of me directly. This gave the business $700 / month in revenue immediately (SEO client) and eliminated the need to do taxes as a freelancer. I asked friends and family if I could help them out with their websites or if they knew anybody involved in WordPress who I could reach out to. Don’t be ashamed to ask for help from the people closest to you. I attended every WordPress DC Meetup I could. Meeting new people means meeting potential clients and networking with important people in your local WordPress community who can refer you business. Our main source of new customers and partners is content marketing. That’s a long term strategy, but worth investing in early while you use the 3 approaches above to start out. We currently manage almost 100 websites and have free trials started just about every day. It all started with a single client. Be persistent and work smart and the rest will happen. I could write an entire post about just this topic! Here are a few of the tools we use regularly and that have a direct and positive correlation with revenue and customer happiness. SEMrush, Ubersuggest.io & Mozbar – I use these for the majority of my keyword research and competitor analysis when it comes to our SEO strategy. Going after long-tail keywords and low-hanging fruit isn’t easy, but these tools simplify things a lot for me. WP Simple Pay & Stripe – accepting payments has never been easier. Some people opt for really complex and intricate payment systems, but I prefer to keep mine as simple as possible. This combination is exceptional. Stunning – although Stripe is really great at what they do, they don’t have systems built out for everything. Stunning allows me to easily allow customers to change their payment information and send all the automated emails that Stripe doesn’t. ManageWP – most of our WordPress-related maintenance works runs through ManageWP. Backups, uptime monitoring, automated speed and security scans and reporting comes from here, so it’s a vital part of what we do. What’s the most useful ManageWP feature in your opinion and why? It’s hard to pick just one here! I guess the backups take the cake. They give our team a lot of flexibility to restore websites which is really invaluable to our team and our customers; the ability to reliably restore a site with a single click takes a lot of pressure of our team and gives us the confidence to push our project and maintenance work to new heights. Not many agencies have a White-Label Partnership option. What’s great about it, and do you find many people looking for it? This is one of the services that really differentiates us from the pack in my opinion. WP Buffs partners with design agencies, marketing firms and freelancers by offering a simple and effective white-label solution. For anybody with clients or customers who need ongoing website edits, performance enhancements, additional security or any kind of regular maintenance, we’re able to step in as their background technical partner. Our partners sign their clients up for a Maintain Plan, Perform Plan or a Perform Plan Pro. They can actually offer everything that’s included in any WP Buffs plan, including the free trials. They can even add pricing to your own website. Our partners create an @theiragency.com email address for our help desk so we can provide edits for their clients. The best part – their clients will never hear about WP Buffs. All changes will be performed as if they’re coming from their team. Our partners get all the credit from their clients, we take care of website speed, security, maintenance and white-labeled weekly reporting (with their company or personal logo) and their clients are delighted. It’s a win-win-win. How do you plan to grow in the future? To be honest, the sky’s the limit. At this point, we know the WordPress maintenance space pretty well and are already outperforming just about every other maintenance company out there. Financially speaking, the most successful exit to date was the sale of WP Curve to GoDaddy. Our goal for the time being is to help as many people with their WordPress websites as possible and provide unmatched customer service; if we can push forward there, the rest will take care of itself. How involved are you with the WordPress community? What do you think the best and worst thing about it is? Personally, I’m very invested in the WP community, and the company’s actions reflect that. I do my hiring via PostStatus job boards, meeting people at WordCamps and my bcc email list of friends and associates in the WordPress space. So you could say that the WordPress space is essential to growing my business. To take it a step further, any successful WordPress company knows that they will live and die by their reputation in the WordPress space. Because the community is such a strong driver of the open-source software, the community can either lift you up or stop you in your tracks. It’s one of the reasons I help drive the growth of our local WordPress DC Meetup and try to speak at Meetups and WordCamps. It’s also why WP Buffs will have sponsored 5 WordCamps this calendar year. The WordPress space gave my business legs, so it’s only right for us to give back. Regardless of the business I run, being part of the WordPress space is something I don’t take for granted. It’s a really vibrant community filled with authentic people who are unapologetically themselves. There aren’t many places where you can put a extroverted marketer and an introverted developer in the same room and see them get along easily; that’s really special. Where can we meet up, any events coming up? When you are not running WP Buffs, where do you hide out? WP Buffs HQ is in Washington, DC. I live in Mt. Pleasant, tucked right into Rock Creek Park where I get my nature fix. When I’m not working on WordPress, I’m probably hanging out with my wife, Sterling, a group of Sandboxers or my dog, Marvin. It’s a magical world, Hobbes ol’ buddy. Let’s go exploring! Great work, Joe! I’d love to learn more about how you put a reliable team together. Awesome, it’s always great to hear from those who are doing it right!